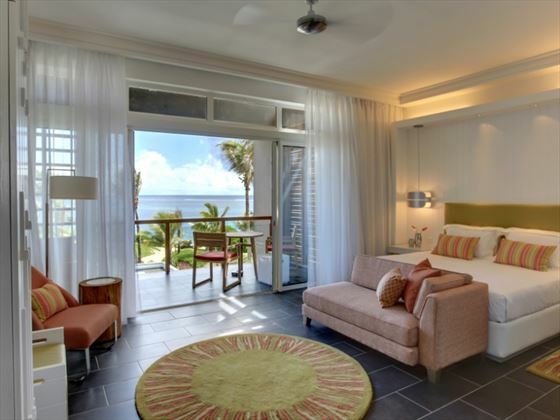 This striking beachfront hotel just oozes island chic, offering an elegant location for families to unwind and enjoy the sunshine. 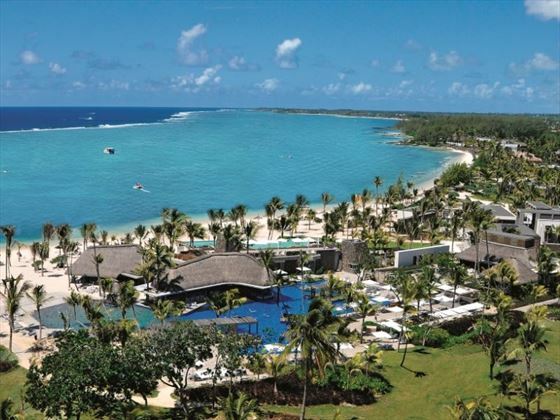 Nestled on the well-known Belle Mare beach, the hotel is surrounded by incredible white sands, turquoise waters, and luscious tropical forest, offering a secluded, laidback ambience. 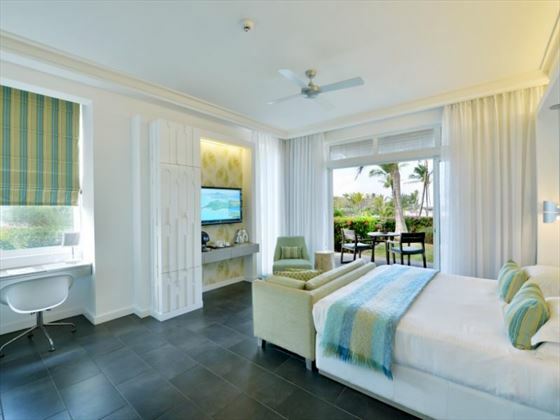 Each room has cool, beach vibe décor with gorgeous views of the gardens or the ocean, bringing you back to nature and offering a spacious, comfortable space to rest your head. There’s plenty to keep the whole family entertained here, with a fantastic climbing wall and plenty of exhilarating water sports, as well as energetic kid’s and teen’s clubs with age-appropriate activities, beach BBQ’s, and even a kid’s pool and evening disco. 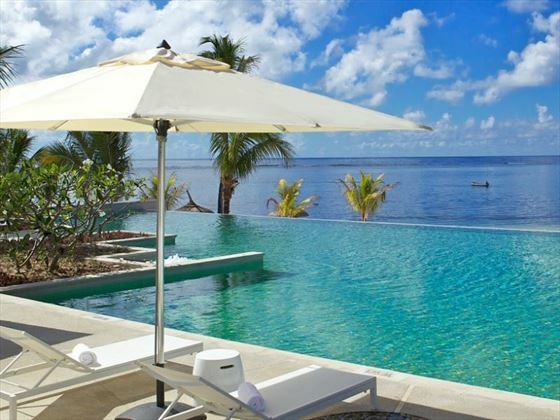 As the kids run around and have fun, mum and dad can spend a leisurely afternoon at the wonderful beachfront infinity pool, indulge in a wellness treatment at the Cinq Mondes Spa, or sip on refreshing cocktails made with local rum and fruit at Shores Bar. We’re sure the whole family will be ravenous after a day of splashing around or relaxing, and Long Beach has a brilliant selection of five restaurants, all offering their own twist on family favourites – including Italian, Chinese and Japanese fare. 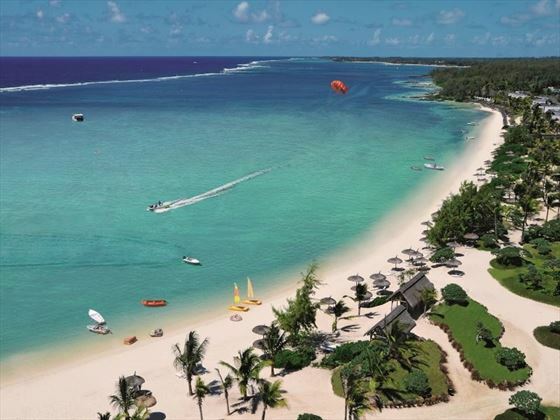 This stunning hotel is located on the Eastern coast of Mauritius, nestled on the famous Belle Mare beach. 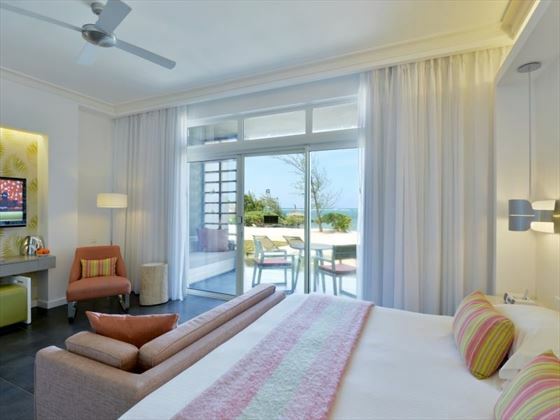 Its beach front location offers a calm and relaxing ambience, though there are plenty of water sports should you fancy a break from sunbathing. 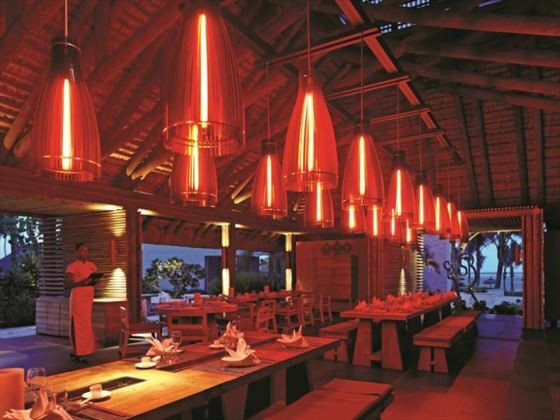 Le Marché – This live cooking arena and international buffet will be sure to awaken all the senses. Each of the seven cooking stations offer flavoursome, fresh dishes, and the lovely patio area offers a picturesque al-fresco breakfast or dinner. Sapori – A quaint Italian restaurant using the finest quality products to create an authentic taste of Italy. The minimalist décor offers a delightful spot to tuck into antipasti, fresh seafood, and fluffy pizzas made in the pizza oven. Hasu – This authentic Japanese restaurant serves its flavourful dishes in a yakitori and sushi central area, as well as offering semi-private and a la carte dining area. The innovative menus were created under the eye of Michelin starred Italian chef Moreno Cedroni, and the décor is modern and cool. Chopsticks – A Chinese restaurant with a laid back atmosphere, well-known for its Sichuan style Catonese and Hunan cuisine. 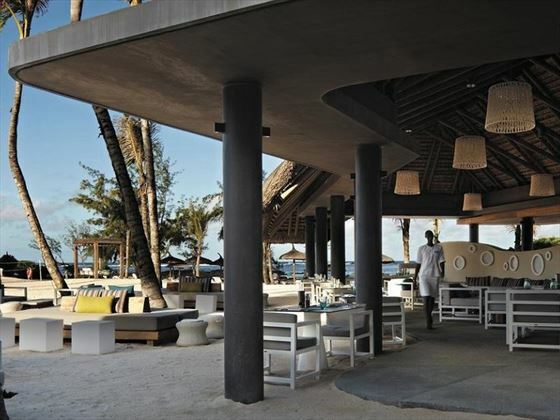 Tides – A colourful beach restaurant offering fresh fish and delicious Mauritian cuisine. Sit back, marvel at the ocean views, and tuck in to sumptuous food. Beach Service – Serving light lunches and an array of drinks, the beach buggy patrols the beach from 10am to 6pm. Tides Pool & Beach Bar – This fun bar has wicked views of the pool and beach, and is made famous by its cocktails made with local rum. The bar also offers snacks, sandwiches and salads for lunch, with afternoon tea available from 5pm. Shores Bar – This cool cocktail and lounge bar overlooks the beach, offering a lively vibe and welcoming atmosphere, with fantastic cocktails created with local rums and fruit. 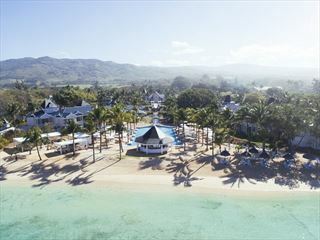 The hotel is located on a gorgeous white sand beach near Belle Mare. 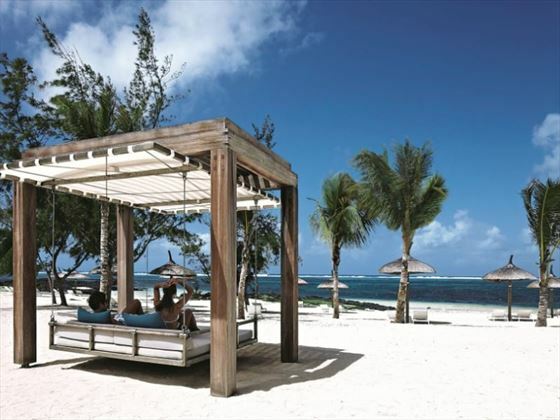 At 40m wide and 1.3km long, the beach is dotted with comfortable loungers and suspended daybeds. 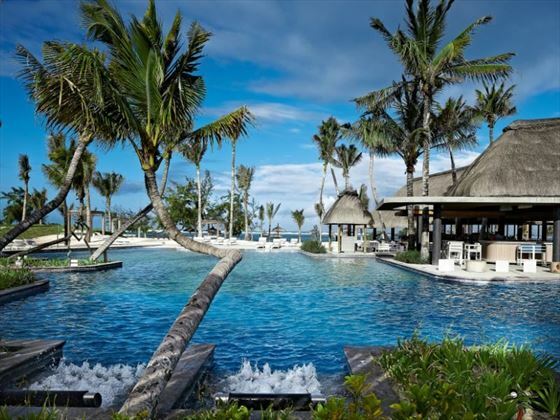 There are four swimming pools, including a 1400sqm heated pool, a 350sqm infinity pool overlooking the beach for adults only, a lap pool and a kids' pool. Cinq Mondes Spa - offers you the exclusivity of a Spa & Wellness Retreat. Everything you could want from a spa including facial treatments and relaxing body massages that embrace yoga, Qi Gong and detox wellness. There are 9 single and 2 double treatment rooms and 1 special bath. 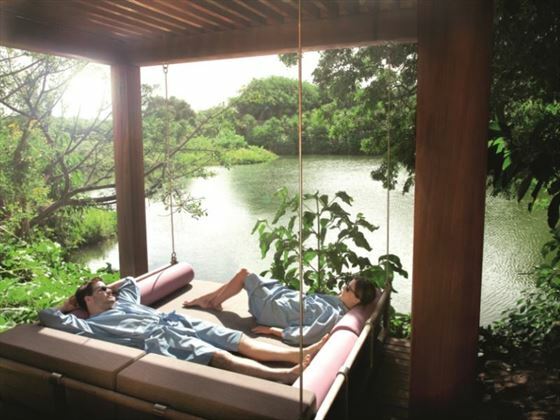 The Outdoor spa pavillion is immersed in the tropical gardens. For a real treat there is a beauty parlour with hair salon and manicure and pedicure treatments. 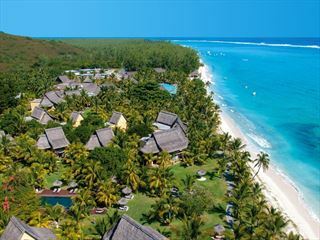 Ile Aux Cerfs Golf Course – This 18-hole championship course designed by golf champion Bernhard Langer is one of the most beautiful in the world. 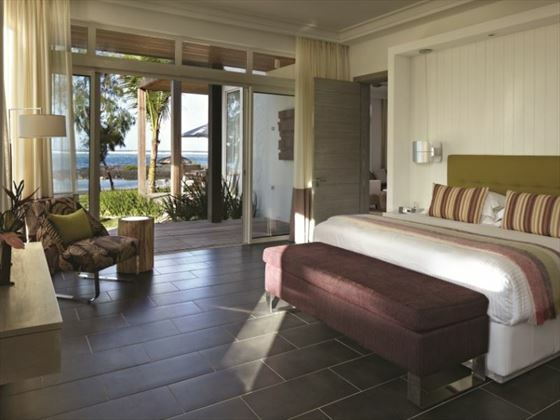 All Long Beach guests have access to the golf course, with a special shuttle service every day. Sun Kids Club – a fantastic kids club for 2-11 year olds, offering a myriad of fun daily programmes suites to every age. There’s also a brilliant sports centre at the club, featuring a small pool, and areas for the kids to play tennis, wind surf, or even go on nature excursions. There’s even a special menu for dinner, with buffets and barbecues, whilst lunch can be ordered at an extra charge. Waves Club – 12-17 year olds certainly won’t get bored at this excellent teen’s club, offering fun recreational activities and adventure outings, as well as fun evening events like cool beach barbecues and pizza nights. There’s even a games room featuring video games, pool, and table tennis, as well as a disco with a DJ.